Approaching the tip of Britain the three leaders chose to hide. The rules of the Krys Ocean Race offer the teams the chance to disappear from the world for nine hours. In the middle of this afternoon, the constant transatlantic leader Spindrift racing, with less than 500 miles to the Scillies and two ‘ghosts’ in pursuit some 60 miles behind, also chose to disappear. The finish of the race off the Petit Minou light is expected at the end of the afternoon Thursday, with a huge welcome into the heart of the Tonnerres de Brest maritime festival, amidst a winners cavalcade Friday at 1500hrs (local time). Great minds think alike? In the case of the Krys Ocean Race leaders, as they count down the rapidly dropping miles to the finish in Brest, it is an initiative of the third placed FONCIA early this morning which has been successively followed by second placed Groupe Edmond de Rothschild and then by the transatlantic race leader Spindrift racing. 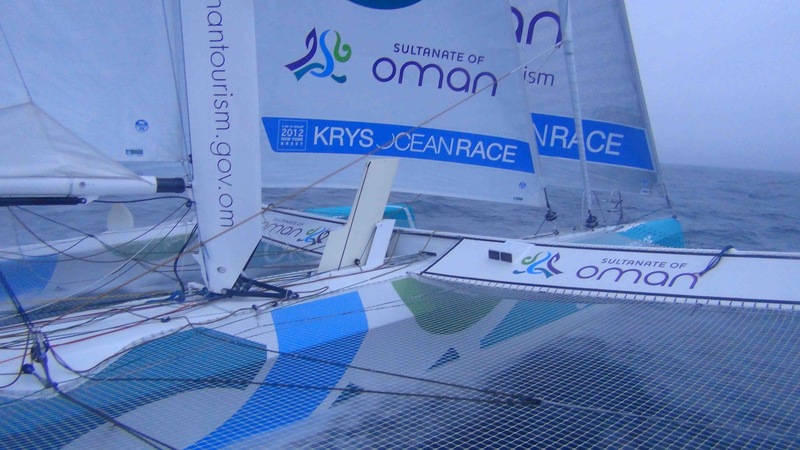 Race rules for the Krys Ocean Race allow teams to have their position frozen for three successive position reports, effectively disappearing for nine hours. Consider that the boats are averaging 27 knots. Over nine hours that can offer significant scope to make a big escape. First to play the ‘stealth’ card this morning, to try and put pressure on the second placed team they are hunting down, was Michel Desjoyeaux’s FONCIA crew. To all intents Spindrift racing was pretty much out of reach with a lead of 80 or so miles and pointing directly at the Scillies gate some 500 miles ahead. The ‘hunted’, Groupe Edmond de Rothschild, then went ‘under the radar’ three hours later. Then, finally, this afternoon so did Spindrift racing, leaving the Josse and Desjoyeaux crews to play a game of seaborne ‘pin the tail on the donkey’. Though the joker cards were all laid out, the one remaining variable was the question over how much runway the leaders would have left. Although there was a provision available to lengthen the course, race direction have decided to maintain the original course, so bringing the leaders to a finish now expected at 1700 hrs local time. So on the strength of this dream weather pattern which has driven them across the Atlantic, riding one system all the way from the Labrador coast to Brittany, even flattening off the Azores high, the winning MOD70 should complete the passage in just over five days - or an average of over 25 knots - an extraordinary debut for the MOD70 class. So blessed have the conditions been that even for these 1000 miles of the race, the seas have flattened. They were described as velvet this morning by Michel Desjoyeaux, so allowing the teams to really turn up the heat on each other, intensifying their attack over the final miles. Incredibly they have made the crossing almost exclusively on starboard tack. 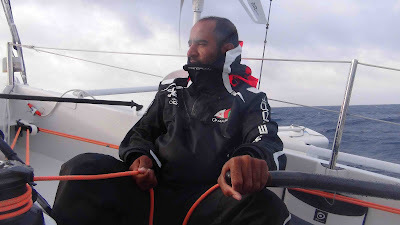 For Sidney Gavignet and the crew on Mussandam-Oman Sail, the smoother conditions and more routine breezes have allowed them to maximise helm time for their less experienced Omani crew, one of the fundamental points of their Oman Sail initiative. As the winds were due to ease for the leader this afternoon Spindrift racing can expect to lose some miles to the chasing duo. Until Yann Guichard and his crew reappear on the 2200hrs (UTC) ranking, no one knows what these gains and losses will be. “It is all going good on Musandam. The guys are going fine, eating well. We probably are trying to take a bit more care of the crew than what they might be doing on Spindrift. We are still using the bunks. I prefer to keep people in good shape, remembering that our initial goal on this race is to finish the Krys Ocean Race. But in general we are really happy. 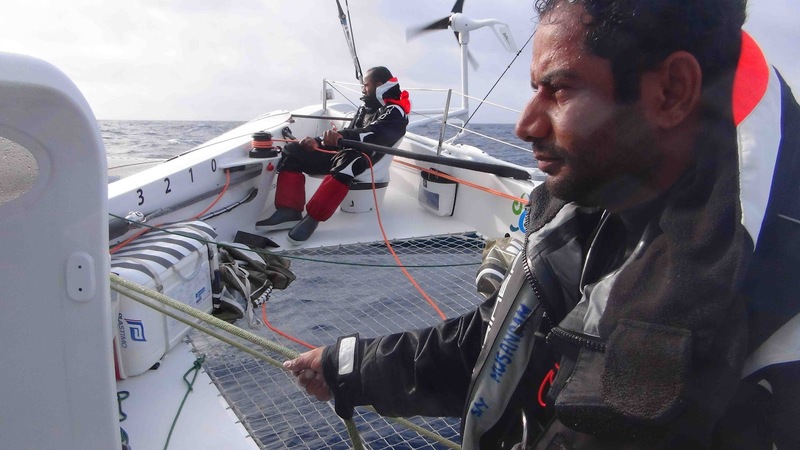 "We are lucky with the conditions with this foil which is reversed and now the good news is that we are not going to have to gybe, considering that moving the foil to the other hull is a 30 minutes process, and also a bit dangerous for the boat. The other good news is that we are probably short cutting a but compared to the three leaders, so we will probably have a little less distance between them and us arriving at the Scillies.